So here it is, my first stab at making granola bars. I wanted to stick with flavors I know and love, so I decided to make orange cranberry granola bars with walnuts. My biggest goal was to make sure they were chewy. I read a LOT of different recipes with a lot of different methods and ingredients, and ultimately ended up using a little bit of all of them to put this recipe together. The result? 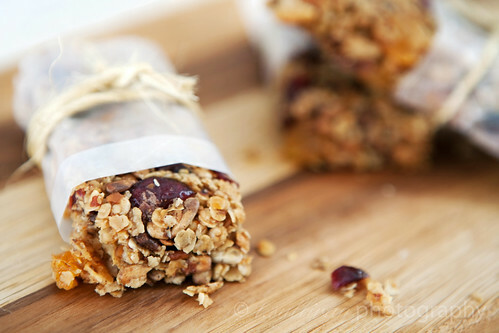 Nutty, sweet, chewy orange cranberry granola bars. I’m not sure how much healthier (if at all) these bars are than the store bought kind, but I can tell you they pack a whole lot more flavor. They’re also surprisingly good at curbing hunger pangs, more so than store bought bars. I’ve really enjoyed snacking on these and eating them for breakfast with a nice hot cup of Earl Grey tea. Now that my eyes have been opened to the possibilities in granola bar recipes, I plan on experimenting with lots of new flavor combinations! I used quick oats for this batch, but I will try old fashioned oats next time. I think it will help the bars hold their shape longer. A kitchen scale really comes in handy with this recipe, so if you have one use it. I used a 7×11-inch pan, but you can use a smaller 9×9-inch or 8×8-inch pan, which will result in thicker bars. * To make oat flour, pulse 1/3 cup of oats in a food processor or blender until finely ground. Preheat oven to 400°F. Line a 7×11-inch pan with wax paper, leaving a few inches of overhang on each side. Spray wax paper lightly with cooking spray. Toast first 3 ingredients (oats and nuts) at 400°F, tossing and stirring occasionally, for about 10 minutes or until lightly browned. (Keep a close eye on them so they don’t burn!) Cool slightly. Toss toasted oat mixture, oat flour and dried fruit together in a large heat-proof bowl. Combine white and brown sugars with orange zest rubbing together with your fingers until the sugar is damp and fragrant. Combine sugar mixture with next 7 ingredients (honey through cinnamon) in small sauce pan over medium heat. Bring to a boil, stirring, and simmer for 1-2 minutes. Remove from heat. Pour warm sugar mixture into the oat mixture and mix thoroughly with a spatula, making sure every bit is coated. Spread the mixture evenly in the prepared pan, fold up the overhanging edges of wax paper and press the mixture very firmly into the pan. (The harder you press, the better your bars will stay together.) Allow to cool at room temperature for at least 2 hours. Once cool, flip the pan over on a hard surface (such as a cutting board), remove wax paper, and cut granola into 14-16 bars. Store in wax or parchment paper separated layers in a tightly sealed container at room temperature, or individually wrap bars for easy to-go snacks. That granola sounds delicious and your photo is just beautiful! This is such a good idea and I am definitely going to try this. My husband tears through packaged granola bars and they’re expensive and kind of mediocre! I’m so intrigued that you can make your own granola bars at home. That is amazing! I’m always making homemade granola, but granola bars I haven’t tried yet. First time for everything! Thanks for the recipe and gorgeous photo! I tried this recipe out and it was amazing, thanks so much for the recipe!